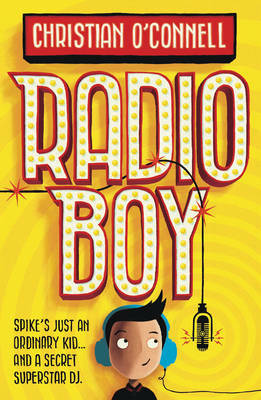 This book is about a boy called Spike who gets sacked from his favourite job, a radio presenter at his local hospital’s radio station, which is also the place where his mum works! Spike is 11 years old and he is really dejected about losing his job, so he goes to see his best friends, Artie and Holly, who make him feel better with some old skool music and out of date buns from Artie’s dad’s bakery. When Spike gets home, he tells his dad about getting sacked and he gives him the idea starting his own online radio station, streaming live from their garden shed in the “jungle” but Spike doesn’t want to do this. The next day at school, the headmaster launches a new school radio show (Merit Radio) and Spike hopes to be the star DJ. However, Spike’s excitement about his new role and his desire to impress the love of his life, Katherine Hamilton, doesn’t last long because he soon finds out that it is going to be run by his enemy, (also the school bully and headmaster’s son) Martin Harris. So, Spike follows his dad’s advice and under the name “Radio Boy”, together with is two friends Artie, AKA Elvis and Holly, they start their own secret radio station in his shed. Using technology, they mask their identities and leave everyone guessing who they are! Is the radio station a big hit? Do they get found out? Does he marry the love of his life? You have to read the book to find out! I recommend it to 9+ readers who like funny stories. I’m sure you’ll recognise the mum and dad in this story because they are probably similar to your parents! I give it 5 stars and hope that Christian O’Connell’s debut novel is a 2017 bestseller. I’m looking forward to his second book due out later next year!